Available in durable fiberglass or rugged steel, New Door Store by EcoView entry doors from ProVia are designed to deliver years of beauty, reliable service and performance. We’ll help you choose a door style that can be customized with a range of colors, finishes, hardware choices and glass options to create a grand entrance that is unique to your home. 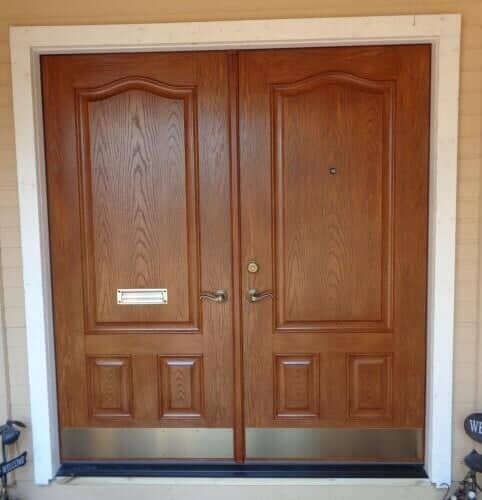 Our ProVia Signet doors deliver a rich, authentic woodgrain look in a durable, maintenance-free fiberglass material. Every Signet door is available in a choice of wood tone finishes, in one, two, four or six panel configurations. You can combine your panel choice with a glass option that includes everything from full-frame glass, to oval beveled glass, to a secure high-mounted window for illumination. Add side lite glass panels for an elegant look and feel. New Door Store by EcoView, Legacy Steel Doors by ProVia are constructed of heavy 20 gauge steel for superior strength. But the wide choice of finish styles and colors mean your new door will be as beautiful as it is durable. We even offer a model in woodgrain textured steel for a natural look.